Sahin: "Getting better all the time"
Dortmund - It has been a long, hard road back into the limelight for . After the 5-1 win over SC Freiburg on Matchday 26 though, the Borussia Dortmund midfielder finally felt like he was getting some way back to his best, thanks not only to his first-ever Bundesliga brace. Starting a game for only the second time since returning to BVB, he made the most of the full 90 minutes, touching the ball 96 times - more than any other player - and assisting for Robert Lewandowski to score in a record eighth straight game. Afterwards, the joyous Turkish international spoke about his ever-improving development, his understanding with midfield comrade Ilkay Gündogan and his respect for head coach Jürgen Klopp. Question: Nuri Sahin, after 40 minutes, it didn’t look like it was going to be such a comfortable afternoon for you. Where was it going wrong? Nuri Sahin: We let Freiburg play too much and that was the problem. We probably deserved to fall behind, but we came back strongly and showed what we can do. That was important, particularly at home in front of our own fans. Question: Were the first-half problems also down to the fact that you and Ilkay Gündogan had to get used to playing together in the heart of the midfield for the first time? Sahin: The problem in the first 40 minutes was nothing to do with me or Ilkay not gelling. Freiburg’s Max Kruse and Marco Terrazzino combined well a few times and they kept things very wide so we weren’t in a position to pick up the second balls. We did that much better in the second half. 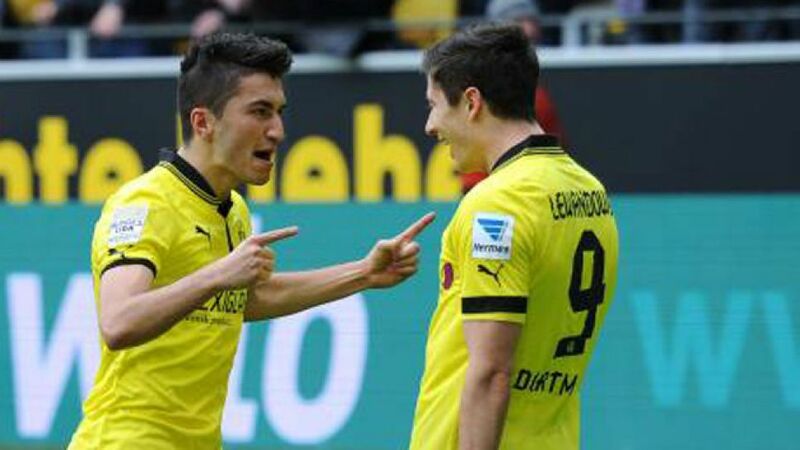 Question: Is the Sahin/Gündogan partnership an option for the future? Sahin: We shouldn’t speculate about that now. We've got plenty of excellent players in the squad and that applies to midfield as well. Besides, we’re going to need all of the players we’ve got, as you could see against Freiburg. Without Sebastian Kehl and Sven Bender, it was important for us to compensate without the quality dropping in this position, and I think Ilkay and I did a good job. Sahin: Leo and I get on really well. He’s got to keep his feet on the ground, although I have to say he trained really well this week. The coach rewarded him with a run-out and he deserved to play and to score. We’re all delighted for him. Question: You and the whole team had to dig deep to get into the game. Was it a question of willpower being able to perform this way? Sahin: This game was another step forward in my development. Parts of the crowd were starting to get restless, but that just spurred me on even more not to hide and to take some risks. I think I'm heading in the right direction. It’s getting better all the time, and you could see that against Freiburg. I’m delighted that I was able to play my part in this win. Question: Was this a day that you had been eagerly waiting for? Sahin: The coach always told me it was just a matter of time before I reached my level and really helped the team, but I myself was getting pretty impatient. I felt an obligation to repay the faith that Dortmund have placed in me. The way everybody has backed me at the club wouldn't happen anywhere else. I started against Hamburg but didn’t play well then. Now I'm hoping the penny has finally dropped. Sahin: My son Ömer was here for the first time and that was a great feeling. I simply had to play well for him. Question: How much of the old Nuri Sahin have we seen against Freiburg? Sahin: I think I’ve been improving bit by bit since coming back to Dortmund, even in training. Now the self-confidence is slowly returning and I’m more comfortable with my game too. I did misplace a few passes, but that’s part of my game - if I didn’t take some risks with my passing, then I’d just be an ordinary player, but that’s not what I want. My game is all about risks and I’m allowed to show that here. The coach doesn’t only allow it, he actually demands it. That type of faith from the coach does me and my game the world of good.